SYRACUSE — A free, public reception Thursday, April 4, will kick off a exhibition at SUNY Oswego in Syracuse titled “Somewhere Else: Paintings by Wendy Stein” and showcasing the abstract stylings of the artist’s acrylic paintings through a lens of playful and empathic brush strokes. Artist Wendy Stein explores texture, color and the relationship between media and message in such acrylic paintings as “Quilt Mountain” in a free exhibition titled “Somewhere Else: Paintings by Wendy Stein” March 29 to May 1 at SUNY Oswego’s Syracuse campus, 2 Clinton Square. The artist’s reception will take place from 5:30 p.m. to 7:30 p.m. April 4. The exhibition, which is free and sponsored by Artswego, runs from March 29 through May 1 at the Syracuse campus, 2 Clinton Square. Stein studied English and religion at Trinity College in Hartford and earned a master’s degree in communications from Syracuse University’s Newhouse School of Public Communications. She recently retired as communications director for Contact Community Services, a mental health organization in Syracuse. Several years ago, she began studying acrylic painting with Scott Bennett, a local artist and technical consultant for Golden Artists Color. Stein explores texture, color and the relationship between media and message through her choice of acrylic painting. In addition to painting, Stein uses another medium, writing. 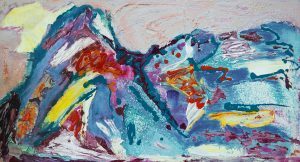 In her process of composing a piece, Stein uses doodling and notes to inform her painting process as she composes her artwork in fluid and confident marks. Her work displays an expressionist tone and approach. Hours for “Somewhere Else: Paintings by Wendy Stein” are 8 a.m. to 4:30 p.m. Mondays through Fridays in the branch of Tyler Art Gallery in the main office suite at SUNY Oswego’s Syracuse campus. For evening and weekend hours, call 315-399-4100.